It is not possible to discern the location or time frame in which instances of SCP-3350 materialize due to their anomalous appearance terms. Field agents must search residencies actively at the hours of 2 and 8 AM on a daily basis for SCP-3350 instances to prevent discovery by any nearby residents. Impersonation of typical mail carriers during investigation is approved by the Foundation if deemed necessary. Any instances of SCP-3350 or recordings of instances found to be in the possession of any individual are to be taken into Foundation custody. SCP-3350-1 subjects altered by SCP-3350 instances are to be held for the following year to negate any changes made to their bodily structure and/or appearance. After this period, they are to be given class B amnestics then released. All other non-SCP-3350-1 witnesses are to be given class A amnestics before their release. SCP-3350 disks must be stored in a standard storage locker at Site-15 for possible later use by the Foundation. Testing utilizing SCP-3350 disks are to be confirmed by one class 4 personnel and supervised by project director Austin Cavan. A proposal for utilizing SCP-3350 instances as standard issue self-aid tool for disabled Foundation agents is pending, awaiting O5 approval. SCP-3350 is the designation given to a group of anomalous DVD-ROMs formated for standard DVD ROM players of their type. 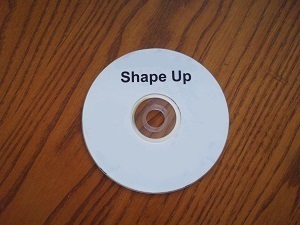 Discs of SCP-3350 are received in unmarked protective sleeves and have disc labels displaying a white background along with the phrase "Shape Up" inscribed over top in black Helvetica font. SCP-3350 are circulated via an unknown source and means, but disks are primarily found placed in the mailboxes of residents around the area of █████████ Canada. Instances anomalously materialize almost instantly within a standard mailing depository corresponding to a household at predicted faster-than-light speeds. Instances of SCP-3350 delivered to residential homes lacking a mailbox or proper mail containing aparatus will be found on a doorstep or other ground area that is most visible to any targeted recipients. These placements are random in time frame, but SCP-3350 instances occur more commonly toward the estates of people who actively discuss, nutrition, body shape, or physical fitness. The delivery process is always unnoticed, and will not manifest if under surveillance of any known type1or under direct eye contact of other sapient beings. SCP-3350's primary anomalous effects will manifest after the following occur. The disc is placed into a device capable of properly reading a DVD-ROM. Upon these conditions being met, the screen will display a white background overlaid with a black outlined silhouette of the subject in front of the utilized screen displaying SCP-3350. This outline will change shape and dislocate along with the movements of subject. After a period of 10 seconds, the screen will display the phrase, "You may now change your shape". These subjects, now under SCP-3350's effects, will further be referred to as SCP-3350-1 subjects. During this period, subjects are able to change the physical construct of their bodies by applying slight pressure to an area of the body. Pulled and stretched areas anomalously gain more mass of tissue or muscle matter under the dermis depending on the force applied by a SCP-3350-1 subject. Squeezed or pushed areas of the body lose mass likewise. A hand can be wiped over any known exterior bodily disfiguration to regenerate it to a degree of full functionality or to normal state of appearance. This can include dysfunctional or completely dismembered body extremities, and non- functioning external organs such as the eyes, nose, and ears. SCP-3350's manipulations can also affect the inner anatomy of the body during more severe editing of an SCP-3350-1 subjects bodily structure, which can include bone and organ mass. More intensive changes are, in certain cases, detrimental to the subjects health after they violate the activation terms of SCP-3350. It should be noted that the SCP-3350-1 subjects are not prone to any type of external bodily damage or physical harm other than their own body manipulation as long as they are within the anomalous activation terms of SCP-3350. SCP-3350-1 subjects become virtually indestructible during this period, as no known method of destruction is effective toward them other than destroying SCP-3350 itself, or the devices used to read or display its data. Once an SCP-3350-1 subject violates SCP-3350's activation terms, the invulnerable effect placed on the subject will cease. The screen will then display a randomly generated positive phrase regarding how SCP-3350-1 appears, then will follow by displaying the number of uses out of 10 that the user has left to utilize SCP-3350. The current session of utilizing SCP-3350 has ended at this point, and anomalous functions cease until SCP-3350 is replayed, or its anomalous activation terms reset. SCP-3350-1 subjects possess the bodily changes they set in place, which will invariably revert back to their original state over the course of a year after utilizing SCP-3350. SCP-3350, having no rewritable features, will anomalously cease functioning after 10 use periods. Further attempts to use SCP-3350 after this point will result in a variable of results, either the screen displaying the phrase, "You've had enough, don't you think? ", or the disc disintegrating completely. SCP-3350 came to the attention of the Foundation after the discovery of an anorexic corpse, which was found inside the [REDACTED] family home in █████████ Canada on the date of 3/21/2010. Local authorities dismissed the cause of death as malnourishment caused by Anorexia Nervosa. The following day, six total reports in the same city of sudden bodily deformities with an unknown cause had been investigated by police, three of these were life threatening. Four of these different SCP-3350-1 subjects had suffered effects ranging from extreme bloating of muscle mass to severe Osteopenia,4 leading to other injuries. Nearby stationed Foundation personnel were quickly dispatched to intervene in the investigation in suspicion of anomalous activity. The households of all subjects were examined to reveal a total of 7 instances of SCP-3350 each within the household of a respective SCP-3350-1 subject, all of which were confiscated into Foundation custody. These disks were later examined to reveal their anomalous properties documented above. All other known witnesses to SCP-3350 instances or their effects were administered class A amnestics and released. Effected SCP-3350-1 subjects were held by the Foundation for examination as well as to find a possible reversal system to SCP-3350's effects. No method was determined utilizing direct means, however the slow reversal of the subject's bodily conditions over the next year was the only noted reversal method to the effects. Interviews with all subjects pre-release revealed the conditions corresponding with the appearance of SCP-3350 instances, all subjects were either on diet and exercise routines, or thinking about beginning such activities. All effects were unnoticeable and reverted back to normal by the reported date of 4/2/2011. All subjects were given a larger dose of class B amnestics and released. 2. Both devices must be given power and turned on. 3. If multiple people are in front of the utilized screen, the closes person to it will be subject to SCP-3350's effects.